Marco’s Pizza knows how to throw a party! A big thank you to Robb and Melanie Wallace! There was something for everyone—pizza, caricature artists, face painting, a balloon artist, a photo booth, music, the chance to test your throwing arm and dunk your favorite fireman, and a friendly rivalry between the firefighters and Marco’s staff in tug-o-war. The firemen also showed off their other talents as they line danced and played games with the attendees. Even our dogs were made welcome with their own treats and activities. Fireman Mike poses with the specialty pie that now bears his name. In addition to a range in types of pizza provided, there was a special pizza sample of the winning Fireman’s pizza–Fireman Mike’s Pizza (cheese, spinach, pepperoni, crumbled sausage, bacon, onions and garlic butter crust). Any way you look at it, Firefest was a great success. 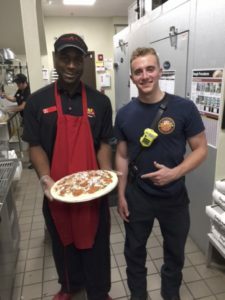 Approximately 600 people joined in the festivities held in N Highland Park on Sept 24 to celebrate the opening of Marco’s Pizza, and raise money to help fund the restoration of Fire Station 19. The total collected was $4,910! As with any successful endeavor, there are many who contributed their resources to make it seem so seamless for everyone else just enjoying the day. Thanks to the following organizations and businesses for their contributions, most of which were raffle prizes. Kris Colluro Smith was the winner in the drawing of the 5-year pizza contest. 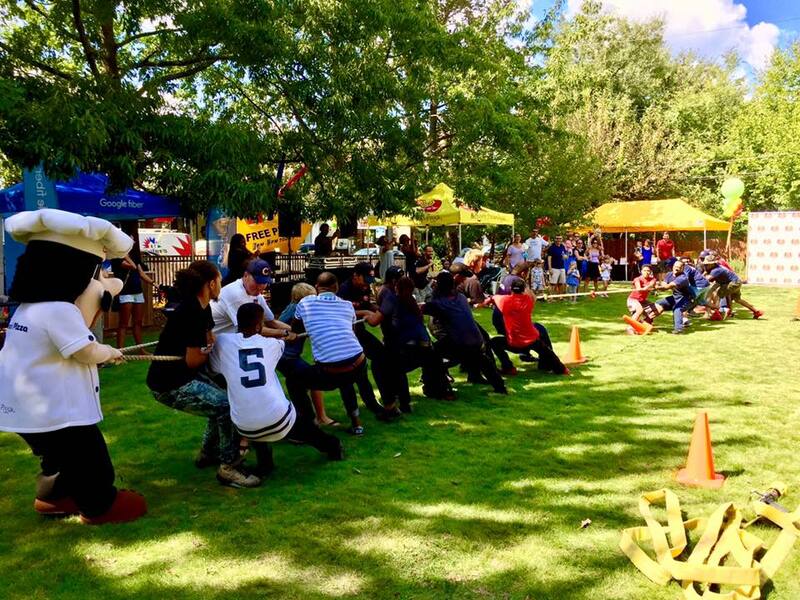 Tug-of-war was one of the day’s most popular activities. Be sure to drop by and thank the participating businesses when you get a chance. Marco’s Pizza is located at 798 North Highland Avenue Suite B. The design phase of the restoration project is in its initial start-up phase. Updates will be provided as the project progresses. Our next fundraising event for the Fire Station 19 restoration is Santathon on Dec. 10. We hope to see everyone there! This entry was posted in news and tagged 2016, firefest, firestation#19, marcospizza by John Becker. Bookmark the permalink.